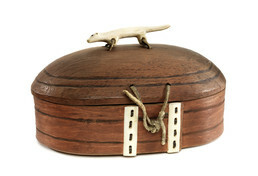 Decorated small boxes with tight-fitting lids held jewelry, small valuables, and tobacco. The body of this box was made by boiling a thin rectangular piece of wood, bending it into an oval shape, then stitching it at the front through decorative ivory bars. The carving on top is an ermine.